Back in January, I reached out on Instagram to ask for people’s top tips to reduce their energy bills. I received quite a few good ideas which I was able to implement and though I can’t accurately monitor the changes (we can’t have a smart meter installed at the moment unfortunately), I have submitted regular meter readings to my supplier and am pleased to report that my monthly usage has gone down! 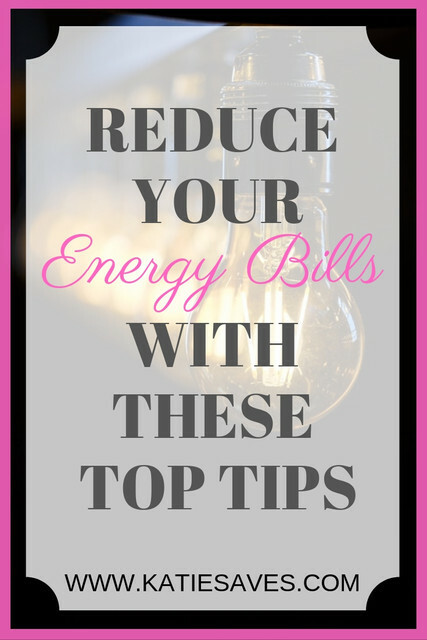 Therefore, with that in mind I thought I would share with you my top tips for reducing your energy bills. A few months ago I used this tool at Uswitch to check if I was on the cheapest energy deal with the cheapest supplier and ended up making the switch to Bulb. My monthly direct debit reduced from £149 to £118.31 which is a saving of £368.28 a year and as it’s based on actual usage (which I found on my gas and electric bills) there shouldn’t be any nasty surprises. If Bulb is your cheapest option, then sign up using my referral link and we will both receive £50 credit on our account! Unfortunately this is not an option for me at the moment because of where our meters are (apparently when the new ones come out, we’ll be able to – fingers crossed!) but everyone I know who has a smart meter has said how much more aware they have become of what they’re using. According to the energy saving trust (source), switching a traditional bulb to LED can save you up to £6 a year on Electricity. Whilst this might not seem a lot, think about how many bulbs are in use in your home and this could add up. I turned radiators off in unused areas such as the hallway, the utilty room and the bathroom (we have a radiator and a heated towel rail) and turned the other radiators around the home down to 3 as they were all on 5 and scalding to the touch. The house still feels warm, but it’s obviously much safer now as well since Elise is on the move. We are terrible for leaving the dishwasher switched on after a cycle has finished, the washing machine blinking when a load is done and turning the TV off using the remote instead of switching it off properly – all of these things leave the devices in standby meaning they continue to drain electricity even though they’re not in use. I’m trying to make a conscious effort to ensure that things are switched off properly instead of paying for our laziness. Cleaning is not just necessary to have a nice, clean home environment, but also to keep appliances running efficiently. Until someone on Instagram pointed out that you should clean the coils on the back of the fridge I literally had no idea. If appliances have to battle against dirt and grime to do their job they will have to work harder and longer to create the same result as an efficient appliance therefore drawing more energy. So remember to regularly clean your large appliances – the aforementioned fridge-freezer (including regularly defrosting if it ices over), clean out the tumble dryer filter (also a fire hazard if this isn’t done regularly! ), clean your washing/machine and dishwasher, unclog your hoover and clean the filter etc etc. One of the biggest things that increased our energy bill was buying a tumble dryer. I just knew that once the baby was born we’d never be able to keep on top of the laundry without one (little did I know then that she would have reflux and our washing would go from 1 or 2 loads a week to 1 or 2 loads a day!). As I mentioned at the start of this post, if we reduced our dependency on the tumble dryer our bills would fall even more but unfortunately, time saved wins over money saved in this instance. However, there are a few things we are trying to do to reduce the usage. Using dryer balls to reduce the length of time it is running for, putting heavy loads on an extra spin, drying delicates on radiators and as mentioned in the last point, ensuring the filter is cleaned after each use. Lots of people recommend using these heated airers (*not an affiliate as I have never used one!) in place of a tumble dryer as they claim to cost less than 4p an hour to run. Of course, you could always just use a traditional, non-electric airer too. (This option is too time consuming for me at present). “IT’S LIKE BLACKPOOL ILLUMINATIONS IN ‘ERE”. – Something that we’ve probably all heard our own parents scream at us in the past, and now we probably find ourselves screaming it at our own children (or in my case – husband). But it’s one of those constant battles I find myself in. Every light in the bloody house seems to be constantly on. Every time I leave a room, I turn the light off and I’m constantly trying to get Luke to do the same! I like to keep the house warm to a certain temperature and since Elise was born have had the thermostat set at 20c, I’ve now reduced this to 17.5c and am yet to notice a difference despite it feeling much colder outside these past few weeks – plus most people that come into our home complain about home warm it is! When it was just me and Luke we would warm ourselves before putting the heating on but that’s changed since Elise was born. However, we definitely saved money by doing it! Keep throws on the settee, use a thicker tog duvet in winter, wear socks and slippers around the house and put a jumper on… then if you’re still cold crank the heating up. I hope you’ve found this helpful. There are definitely lots of ways to be much more frugal with your energy-saving mission but these are the ways we’ve reduced our bill whilst not resorting to some of the extremes you see being suggested. We have a one year old so we have to be realistic – believe me if it was just the two of us again we’d be back to no heating or tumble dryers! "Survey Sites – The Ultimate Guide to the Best Paying Sites and Apps"